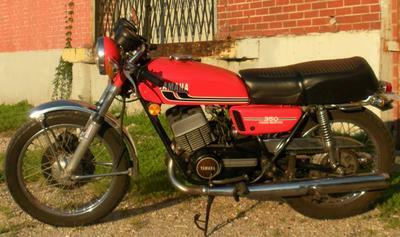 The 1975 Yamaha RD 350 for Sale has a rebuilt engine PLUS I have done a lot of other work. I also have a few parts for the bike including an original rear fender, taillight, turn signal, and a few other rubber seals. Clean title in my name! It runs on premix only but I do have 2 pumps if you want to rebuild one and install it. I also have a PDF owner's manual that I can e-mail to the new owner and I can recommend a web site where you can buy any part you need for the bike! The RD350 is an awesome motorcycle that is super fun and FAST to ride around town. It is both fast and a Giant killer that beats Harley Sportsters with over twice the engine size. As nice as it is; it could use a new back tire and there's a in the horn and its tags are expired. I haven't gotten around to getting it tagged after the motor was rebuilt and I have never been stopped on a motorcycle (I do ride it with insurance). The 75 Yamaha RD 350 is always on the top of the list of bikes to own/ride from the 70s since it was the fastest 350 around and would commonly beat 750 bikes back in the day. I knew a guy who had one that said he used to drag race his to make extra cash! owned it for 3 years and have invested a lot of money into it. To gas it up, you have to mix the fuel and oil because the oil injection pump has been removed and it needs a new coil. If you are aware of any problems that are known to be associated with this vintage Yamaha or if you simply would like to voice your opinion or write a review you are more than welcome to do so using the space below that has been provided by Gogocycles Used Motorcycles for Sale (and PLEASE do not neglect to include your contact information in your email or to provide a phone number or email address!) so that I can respond with answers to your questions or so that our visitors can respond to your remarks or voice their own opinions if they would like. GoGocycles appreciates your interest in the 1975 Yamaha RD 350 for Sale as well your making comments or sharing any information that you have on it to make the biker community aware of any problems that are commonly associated with the 1975 model or to highlight its positive features and help potential buyers make informed decisions. The old 1975 RD 350 has a clear North Carolina title (located in Pflugerville)and it will come to the new owner with a helmet. My asking PRICE is $2900 (Sorry, but if you want ride it you must have cash in hand and if you wreck or brake it you bought it!) or you are welcome to submit a best offer and be sure to mention that you found this ad on GoGoCycles Used Motorcycle Classifieds gogocycles.com. I don't need to sell but wouldn't mind starting a new project. I found a 1973 RD350 stored in a school bus at a junkyard. Bought it but still haven't done anything with it. Good compression and shifts through though. I am interested but would need more pictures. If you have some, pl send to gheron@terratherm.com. I am looking for one of these to restore - it was the coolest bike when I was growing up.